A man walks past a Sputnik Serbia sign near the company's office in Belgrade (file photo). Studio B has been one of Belgrade's most popular radio stations for decades. In the 1970s and 1980s its "Good Morning Belgrade" program was a staple of most Serbian households, and its host, the iconic Dusko Radovic, made sure that all his listeners started the day with a smile. Radovic passed away in 1984, and the country of which Belgrade was the capital city during his lifetime is no more. Much else has changed in the country -- and on the airwaves. Radovic's old slot now belongs to Sputnik, the Russian state-sponsored media outlet, whose newscast greets Belgraders every morning instead of his cheery voice. The change is symbolic of Serbia's current role as one of Russia's main strategic concerns in the Balkan region, with Moscow using all the soft power at its disposal to win local hearts and minds. Sputnik only started broadcasting there in January 2015 -- but it has more than made up for lost time, not least due to the presence of a battery of other Russian media and institutions hammering home the same message. Sputnik is just one out of over 100 pro-Russian media and NGOs, according to the Center for Euro-Atlantic Studies (CEAS), a Belgrade-based think tank. The head of CEAS, Jelena Milic, explains why Serbia is an easy target for Russian soft power in her study titled "The Russification of Serbia." "Serbia, as the largest predominantly Orthodox and Slavic country in Central Europe which is yet to become a member of the EU and does not want to become member of NATO, [is] in a dire economic situation with the public exposed to strong propaganda and glorification of traditional Russian-Serbian friendship." In Milic's opinion, we are witnessing the "Putinization" of Serbia, despite its formal progress toward the EU which should, in theory, preclude the former. 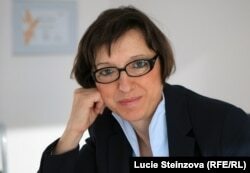 She coined the term "Putin's orchestra" to describe what she sees as the coordinated attempts by individuals, groups, and institutions to undermine public support for European integration, to delay Serbia's rapprochement with the West, and promote Russian interests. "There is more and more evidence that some members of 'Putin's orchestra' are financed directly from Moscow, she writes. Belgrade-based analyst Bosko Jaksic does not see pro-Russian groups and individuals in Serbia acting in a coordinated manner yet, but that may not be far away. "Without a doubt there is an aim to gather those atomized centers of Russian influence into a single, more powerful unit. Although they are not currently operating on a national frequency, so to speak, we can already see this type of coordination at the local and regional level, and the goal of becoming a major player in Serbian politics is evident," Jaksic told RFE/RL in a recent interview. Jaksic, who was among the first to observe the phenomenon of the Russification of Serbian nationalism, sees the bastions of Russian influence not only among fringe right-wing nationalist groups, but also in more mainstream political parties -- some of which are members of the ruling coalition -- as well as the Serbian Orthodox Church and student organizations. "Those are all targets of Russian soft power, and it must be said that Moscow's assessment of the most effective ways of achieving its aims has been proven correct: the promotion of Serbian clero-nationalism, anti-European, and anti-Western sentiment." "Clearly part of it is the emotional appeal of Mother Russia based on a shared Christian Orthodoxy, Pan-Slavism, and the economic and military ties forged during the time of the former Yugoslavia. The combined effect of all these assaults has led to what I have called the 'Russification' of Serbian nationalism -- in other words, its nourishing [of Serbian nationalism by Russia] in order to swerve the country away from its European path." The idea of Russian-Serbian brotherhood that is at the heart of the appeal of Russian propaganda is based on a myth, according to Jaksic. However, it is a myth that has been skillfully cultivated by the Kremlin, taking advantage of established Russophilia as well as a strong network of pro-Russian NGOs and institutions. "Most worryingly, these [Russian NGOs] are especially active at universities, and have been extremely successful in the recruitment of young people," Jaksic says. Russia's first NGO was formed as far back as 1913, and since then various pro-Russian institutions have been exerting influence on different segments of Serbian society and in Serbian political circles. Jaksic points to the Russian Institute for Strategic Studies that has been promoting so-called social diplomacy and fomenting Serbian nationalism hand in hand with a love of Russia. "More important still is the promotion of the Russian political model," Jaksic says. "This is the real concern, not because of any anti-Russian sentiment, but rather the promotion of a political idea that is fundamentally opposed to Serbia's strategic interests, the values associated with modern liberal democracy embodied by the EU." It should also be pointed out that most foreign investment in Serbia comes from EU countries (82 percent) and almost two-thirds of Serbian exports are likewise destined for the EU. Whether as an orchestra playing in unison or a collection of more or less disparate groups and individuals, the effect of Russian propaganda and influence is being felt in Serbian public life. In early August, the Office for EU Integration announced the results of its regular survey, which showed that support for EU membership in Serbia has fallen below 50 percent for the first time. Milic's study identified the University of Belgrade as the main hub of Russian propaganda, and Jaksic finds this most worrying. "The [Orthodox] Church is undoubtedly the most powerful transmitter of Russian influence, but elements of the university [of Belgrade] are not far behind. That is both paradoxical and extremely concerning -- that members of the younger generations are being recruited by Russian-backed nationalists, and that Russia is being presented as some kind of alternative and salvation." There has been an evolution in Russian aims and ambitions, according to Jaksic, from the short-term goal of using scare tactics to block Serbia's mooted NATO membership, to offering an alternative to the EU in the shape of a Eurasian federation, by presenting the EU as a failed project. "The image of the EU being promoted is of a region that was once blessed with peace and prosperity, that has been shaken to the core by a succession of crises, by rampant nationalisms, by terrorism," Jaksic says. "Such arguments are endlessly repeated to recruit an entire generation of young Serbs who were already losing faith in European integration for other reasons." The success of Russian-promoted narratives and the spread of Russian influence has clearly emboldened the Kremlin to expand its official presence in Serbia. This is suggested by recent efforts to secure diplomatic status for the staff of the Russian humanitarian center in the city of Nis. This is a travesty, according to Jaksic. "I have already promised that if the Russian humanitarian workers are granted diplomatic status I will demand diplomatic passports for all Serbian firemen." While a recent visit by Western officials concluded that the Nis humanitarian center was not currently being used as a base for covert military-intelligence operations, the fear remains that it could be put to other uses. "While president Vucic appears to be against it (the granting of diplomatic immunity to Russian aid workers) -- in fact last October's visit by [Russian Prime Minister Dmitry] Medvedev was apparently cancelled because the agreement over the humanitarian center fell through -- there are plenty of those in Belgrade who support this and similar moves to appease Moscow," adds Jaksic. The Nis humanitarian center is only the latest manifestation of Moscow's bullishness in its approach to Serbia, an attitude seemingly vindicated by the shifting of public opinion in its favor and the success of Russian propaganda, especially among university students and the young. However, it also exposes Serbia's real and growing dilemma, caught as it is between what Jaksic describes as its real economic and strategic interests -- European integration -- and the siren song played by Putin's increasingly raucous orchestra in Belgrade.